My concerns were logistical questions so keep in mind all of this is still pretty fluid and being worked out as I write this. In fact the person whom I spoke with was going into yet another casting meeting after our conversation so please bear in mind that all of the dates with one exception are floating dates and are not 100% confirmed. I'll explain on each. The slots are filling up fast (in fact most likely faster than in any other year honestly) so don't wait to get your application in. They are NOT taking Youtube submissions and unfortunately are not relenting on their over 21 years old clause this year. Given the following information, it is a forgone conclusion that they will NOT extend the deadlines as they have been in previous years, in fact it is entirely possible they will fill up all slots available before those deadlines so don't wait until the last second! Projected spots for walkons are.. literally in the single digits and if they fill up they will only have 1 walkon.. period.. so don't delay! Regionals: Each city will encase 2 separate regional competitions. Each region will run on it's own day. Approximately 125 people will be running for each region for a total of 250 people in each city. So for example day 1 of the event will be say.. Northeast region (about 125 people) run the course that one day. The next day would be Southeast Region (also about 125 people). Winners of each individual region will earn a $2,500 cash prize. Regional Finals: On the following day the top people of each region (top times I'm told) will go head to head for the $5,000 cash prize for that city (in this case Miami, Florida) for what it's being called Regional Finals. From these Regional Finals will the 100 competitors be chosen for the final in Las Vegas, Nevada in April. It is unknown at this point exactly how many from each region will be chosen for each segment. Casting does exactly that.. cast.. NBC will be doing the logistics including rules and organization of the actual event. 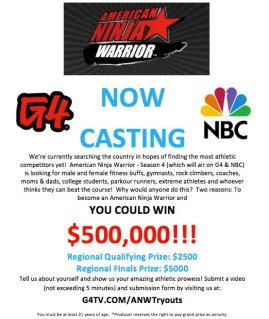 This is different from previous years I'm told as NBC is doing everything (organization-wise) and not G4. It is also unclear if Regional finals will be re-running the same course twice or an amended course (like ANW 2-3's Semi finals from the past) where the first stage is tweaked and extended. Honestly, I forgot to ask.. Given previous ANW prelims this is only an educated guess. I do know that fastest times will determine the Finalist in Regionals and Regional Finals. Dates: Note: These are floating dates, time-frames, etc. These are the proposed dates they are working around with a minimum of 3 days at least for each city so bear that in mind. They are also working hard at getting weekend dates wherever possible but as of now these are the time-frames for each of the city prelims. Now, Finals. The ANW4 Finals comprising of the 100 competitors that survived Regionals will be competing on a 4 stage course (with the help of TBS whom also did Sasuke Malaysia and upcoming Sasuke Malaysia 2 (May, 2012)) will occur on the weekend of April 21-22, 2012 in Las Vegas, Nevada. The ANW4 Final itself will be a Sasuke-grade 4 stage course created by TBS the broadcasting company of Sasuke for the past 14 years. Winner of that event will gain the ANW title and a cash prize of $500,000 US. I presume that unlike Wipeout they would have to complete all 4 stages (just like Sasuke). It is unclear if top times within the Regional Finals will determine the top 100. I'm hoping not.. but that's another story and something I do not have an answer to. I'm not entirely sure anyone knows the answer to that yet honestly... NBC is handling that end of the organization nightmare so I doubt I'll ever get that answer honestly. Either way that is about the only date set in stone. Location is still being worked out so that information is not public knowledge. What I am interested in is whether or not spectators are allowed to watch the Final in Vegas and I got my answer - YES!!!! All events including Regionals, Regional Finals and the ANW4 Final in Vegas are open and free to the public. It is unclear as of yet how the public entry process will be handled (particularly the Vegas Final). Once I get information (especially if it's on a ticket basis) I'll post that information here. I've been besieged with questions as to if people can take their sons and daughters to watch this thing live (especially since Sasuke in Japan is invite only and a closed set). I'm very happy to announce that it is indeed open and free to the public but as of yet details of that organizational feat hasn't been announced. I'm not even sure they know it yet themselves as they are finalizing locations first then deal with the minutia later. Regionals most likely will be handled just like Venice Beach from ANW1-3 was handled (available open bleachers.) Again, educated guess based on past history. One final thing is that it seems more and more obvious that just like ANW3, the Japanese stars will most likely not be invited as guests to visit ANW. Seems ANW2 was the only exception to this. /sigh one can dream. Also, no word yet on the fate of Sasuke 28. If I hear anything otherwise I'll post as well.. most definitely!